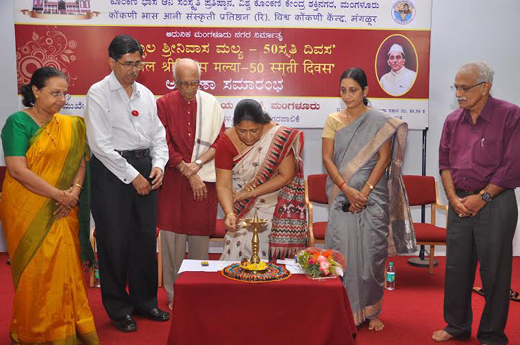 Mangaluru, Dec 19, 2015: The Konkani Language and Cultural Foundation and Vishwa Konkani Kendra jointly observed the 50th Smriti Diwas of Ullal Srinivas Mallya, the architect of Modern Mangaluru, at a ceremony held at the Kendra premises at Shaktinagar on December 19, Saturday. Mangaluru Mayor Jacintha Vijay Alfred inaugurated the programme by lighting the traditional lamp. Basti Vaman Shenoy, Founder of Vishwa Konkani Kendra, welcomed the gathering and spoke in commemoration of late Ullal Srinivas Mallya. Shenoy and other dignitaries present on the dais paid floral tributes to the portrait of Mallya on the occasion. Mayor Jacintha Alfred distributed scholarships to students studying Konkani as an optional subject in schools. Shakuntala R Kini, senior announcer of Mangaluru Akashavani gave a brief profile of Late U.S. Mallya, the ideals he propagated and his contributions to the region. Akhlla Alva, Corporator of Shaktinagar Padavu, Mamatha Shenoy, former corporator and Bolantur Prabhaker Prabhu, Secretary of Vishwa Konkani Kendra were on the dais. Students of Bhuvanendra School, Karkala and Nalanda English Medium School of Mangaluru presented variety cultural programmes. Kasturi Usha Mohan Pai compered the programme. Dr K Mohan Pai, Chief of Konkani Language Education Committee proposed the vote of thanks.